This release includes the new and improved Script Editor! The old “outline” style has been replaced with a visual graph and has drag-and-drop functionality similar to the Dialogue Editor. As shown below, the new Script Editor has been reworked into a more user-friendly editor. If you have previously created any scripts in earlier versions of RPG in a Box, the Script Editor will automatically generate a visual graph for your script once it is opened in the editor. It’s not perfect, but with the drag-and-drop functionality you can easily rearrange the nodes at any time into a nicer layout. The script palette works the same as before, but will now add a node to the visual graph for the function selected. 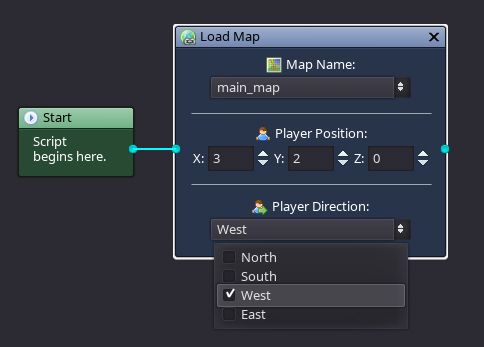 Once a function is added, you can click on the output of another node and drag to the function’s input to create a connection. The source code for the script will be updated in real-time and can be previewed at the bottom. Each script node contains a set of parameters that pertain to that specific function. For example, in the “Load Map” node that we’ve added to the script below, we can choose the map to load, the starting player position, and the direction the player should face. Whenever possible, the input fields will contain a list of available values to minimize the time spent needing to refer elsewhere. Also, where appropriate, the Entity Expression Builder and Conditional Expression Builder dialog windows will display to make it simple to fill in parameters such as the entity for which you want to play an animation or the conditional expression when evaluating a condition. 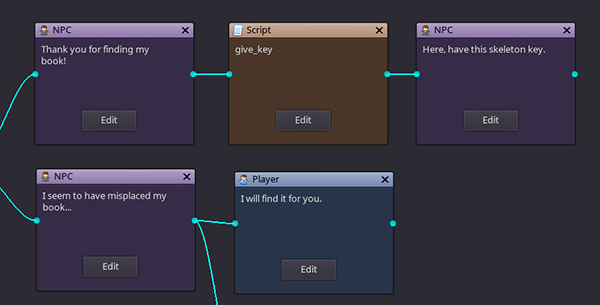 In addition to the new Script Editor, a couple of minor changes were made to the Dialogue Editor. 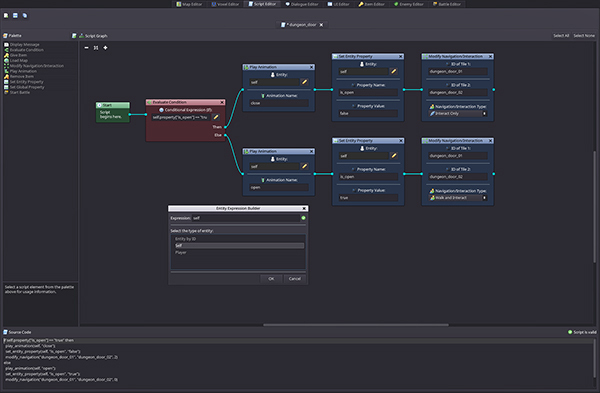 The visual appearance of the dialogue nodes were tweaked and improved, including title bar icons corresponding to the node type, to match the style of the Script Editor. “Select All” and “Select None” buttons were also added to the Dialogue Editor toolbar. I hope you enjoy the new version of RPG in a Box! I always welcome feedback, and I appreciate the continued support and words of encouragement. Thank you for reading!